I’ve just signed my third 12 month tenancy contract in London and well, I guess I feel like I now have enough experience to pass on some tips, tricks and information to any of you looking to get a place in London for yourself. It’s no secret that London is not the cheapest place to live, but it’s expensive because of how desirable it is. It’s expensive in comparison to other places because of just how much it has to offer as a city. It’s only when I take a step outside of London and imagine living somewhere else that I really have appreciation for what’s on offer here. The endless pop ups, markets, nights out, days out, adventures, contrasting suburbs and dining options are just the beginning. We have airports on hand, train stations to connect us at ease to the rest of the country and incredible amounts of opportunity for nearly every career out there. London is where the networking happens, it’s where new businesses thrive, where students fly and it’s just such an insane place to live whilst you’re young or have the energy to keep up with it. I have had the most incredible few years with London as my base and I’m so excited to have just moved into a house (rented apartments before) with a garden, just in time for the summer. So, if you find yourself right at the start of the process with just the desire to live up in the big smoke. Where on earth do you start? London is huge and as I’ve mentioned previously, has such contrasting suburbs. One street can be so different to the next and so setting your radius when searching to include the entire city is going to be like finding a new outfit on ASOS. Extremely time consuming and rather draining. It’s good to have some idea of where you’d like to be, whether that’s north, east, south or west. If you are clueless, spend a couple of weekends exploring different areas and get a feel for the energy and communities on offer. Places i’ve considered in the last 3 years: Shoreditch, Bethnal Green, Camden, Wandsworth, Clapham common, Fulham, Sands End. 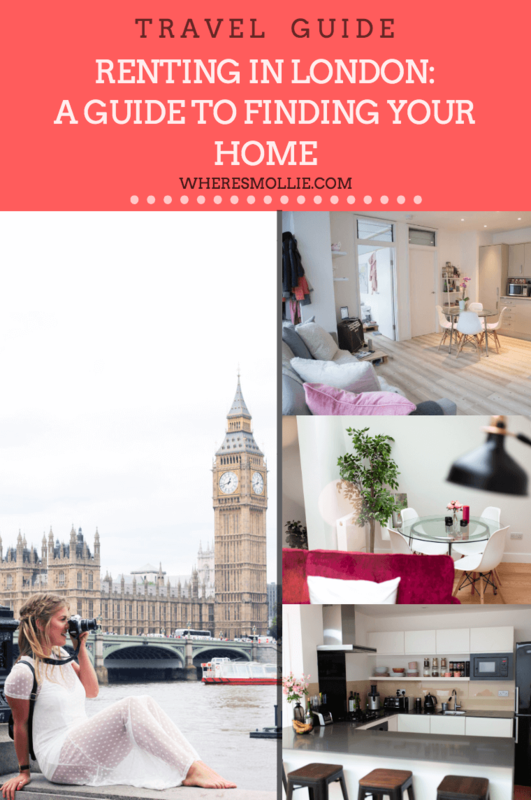 See my 48 hour guide to London here. Have a think about when you actually want to make the move. If it’s 3 months away, don’t waste your time looking now. I mean for research purposes, yes. But for all 3 properties I’ve lived in in London, I’ve applied to the advert within minutes / hours of it being put online. Start looking the moment you’re ready. The good ones come up and they go straight away. Property to rent in London is in high demand and particularly if you’re looking for a bargain / decent place, it will go right away. You have to be on the ball and ready to move within the next week or two, if not right away! Top tip: We applied to our Bethnal Green place an hour after it came online and had paid the deposit by the following morning. We applied for our Fulham place a day after it came online and paid the deposit within the week. We applied to our Wandsworth place an hour after it came online and had paid the deposit and moved within two. Who do you want to live with? What’s your budget? The price you will pay for a room in London will depend on how many people you’re willing to live with. You can expect to pay £1000 – £1600 for a basic 1 bed apartment in London (without heading right out) and then pay significantly less the more people you add into the equation. Of course, you have to weigh up how many people you want to live with vs. how many people you actually know that want to move out and how willing you are to welcome in new friends. In Bethnal Green I lived in a 2 bed flat with a friend and paid £775 per calendar month plus bills. In Fulham I lived in a 2 bed apartment with a friend and paid £1100 plus bills. In Wandsworth, I’m now living in a gorgeous 3 bed house with a garden and two others for £950 per month plus bills. The more people that you live with, the more you can divide out the bills. If you’re keen to find a property that you like and then want to fill it with new friends, SpareRoom is amazing. I found my flatmate and now best friend Amy through SpareRoom and we’ve just found our third tenant on there too. There are endless amounts of letting agencies and ways to find a room / apartment / house in London. It can be pretty overwhelming, hence why I suggest you narrowing your search down to a particular area. If you know where you want to live and just want to move in without the faf of estate agents etc, you could find a room being advertised online by current flatmates. SpareRoom is a prime example of how to do this, there’s GumTree and there are also multiple Facebook groups where vacancies get posted. Tip: Pop something on your Facebook too. You never know what friends / friend of a friend is in the same situation as you! If you’re looking for a place in e.g. Clapham / Wandsworth, Google letting agencies in that area and give them a call. They will ask what you’re looking for and as soon as anything comes up that might interest you they will give you a call. You don’t pay anything for this service but if they secure you a property and you start the referencing process, you will pay an admin fee of £100-200. For our Wandsworth property we each paid £120+ VAT. This included the reference check and contracts. – Estate agents will keep calling you unless you tell them to stop. As soon as you’ve found a place, let the others know / expect to keep getting missed calls. – Some ads with display price per week, some will display PCM (per calendar month). Don’t be fooled by price per week. PCM will work out just over four times the price per week. – Be ready for viewings straight away. Our Wandsworth property was first come first served and we managed to secure it the day after it went online because we were quick and available. If you’re fully on a mission to get a bargain and avoid agency fees (understandable) then it is possible to deal directly with a landlord and this can come with many benefits including lower admin fees and direct / quicker contact when it comes to maintenance / problems. We dealt directly with a landlord on our Bethnal Green apartment and found exactly what we were looking for. For our Fulham and Wandsworth properties, we’ve done it through an agency. OpenRent is the website we found our Bethnal Green property on. Then it’s time to finally enjoy your hard work and get exploring London! Eeeeeeeeek! Tip: Below are photos of my Fulham apartment. Click here for the details and my home inspiration post. Stay tuned for more house blogs including ways to save money when decorating your house! Have you rented in London? How did you find your place? I’d love to know!